You mentioned in an interview with the Tennessee Literary Project that although your parents raised you in a cultured household, you initially did not believe you would become a writer. How, then, did your path to poetry form? I was the son and grandson of professors, so growing up I had plenty of books around and knew how many poets there were in the tradition. Imagining someday being a part of that body struck me as a long shot. I would have said, age 16 to 18 or so, that it was unrealistic from the standpoint of ever making a living let alone making a difference in the lineup of some library’s bookshelves. At the same time I had been making up melodies and songs for years. When I turned twelve I was given a guitar. It wasn’t a very good guitar, but that was all it took for me. This was the 1960s and the coffee house/folk music boom was underway. I sang in a group. The other two members of the group were in college, and they were good. In the summers they had gigs at the Brickskeller and Cellar Door in Washington, and one year they were offered a stint at the Bitter End in NYC, but their parents made them return to the University in Athens, Georgia to finish their degrees. I was still in high school, but we performed some of the songs I wrote. Writing a song and performing it with others was a great way to learn a number of things that were applicable to poems. I learned that a song can stand on the ground of immediate conviction. When the words and the melody fit really well something beyond one’s individual will takes over. Writing songs is a time-worn path to lyric poetry. Along that way one discovers how deeply a poem can burrow. A song’s music keeps moving so the words must be readily understandable, whereas a poem enjoys more license. When I came to college I brought along a stack of poems and naively walked into the office of the editor of The Sewanee Review. Andrew Lytle read them and gave them to Allen Tate who pronounced a few “publishable.” Then they published one, then some others. There were no superlatives uttered, just something about I could do this if I was willing to work hard enough long enough. With that I was convicted. In another interview with Chapter 16 a few years ago, you stated your “long-held belief that the first concern for poetry at any time is figurative thought that leads to a dramatic core of meaning.” Could you elaborate on your position and how it relates to your new poetry collection? I have stated that figurative thought is the “first concern for poetry.” That is because a poem is a mode of thought before it is a form of expression. Poetry uncovers parts of reality we would miss without it. The reason, years ago, I used the term “dramatic core of meaning” had to do with mediating between formalist and free verse arguments. I thought then and still think a poem’s argument and its rhythm are its dominant elements. Listen to a young couple having an intense conversation in an airport, and you will hear argument and the alternation between stressed and unstressed syllables. That experience ought to be enough for anyone to unravel the rest as far as form is concerned. Poetic figure houses a poem’s argument, and the rhythms of the English language reinforce the emotional import of that argument. I was fortunate to stumble upon a video of your poetry reading last fall at the Sewanee Writers’ Conference in which you read some poems from Couldn’t Prove, Had to Promise. One aspect of the reading that strikes me is the humor and tragedy apparent in many of your works (e.g., “Bad Dog” and “Another Christmas Tie”). How do you balance these two elements in your writing? Humor jars expectation and causes rebalancing. It qualifies and redeems. If you damp emotion, as humor can do, a poem’s durability can increase. My purpose with humor is to disarm the reader and to objectify the subject so the poem has a greater half-life. I do not intend something that is just performative; a poem has a kind of ontology to it. It is a consciousness for as long as it lasts. Finding ways to keep such a mind from exhausting itself with its own obsessions is art. It is a way to dwell in a subject. Art is experience without the cost of experience, and it is understanding fused with value. Along with these there is the ideal of seeing something from many sides and judging along multiple lines. Tragedy teaches this. Most lives are lived among tragedies small and frequent. But Shakespeare to Irish wake, there is a place for humor too. We think both ways at once. Could you explain to us how self-revision as well as peer-review with others (such as your editor John Irwin) have helped shape the collection? Of your question about self-revision the main thing to say is that I was more conscious of that process when I was younger. At that time I created an ideal audience for myself consisting of poets whose work I admired. I wrote with the hope my poem would be meaningful in the context of such an audience. I tried to test that poem with the perspectives of whatever my current short list of greats happened to be. I judged poems in light of what I imagined the aesthetic thinking of these poets would be if they were living in the present. That ideal audience changed as my interests changed, and I suppose now I have absorbed certain principles to the point that I feel as though I work alone, though no one does entirely. In the case of “Nod,” the long poem in Couldn’t Prove, Had to Promise, everything derives from the characters in the poem. Revision occurred within the terms of character. And to return briefly to the subjects of humor and tragedy, it is important to add that the characters in “Nod” are not allegorical; they are represented by the poem as physically present. Their humor and their tragedies are real. Were they not real, some of what they say and do would have a different meaning. Humor is a test for what is real. A recent review of “Nod” found it to be an allegory. However the speaker, the main character who narrates the poem, while never named is in fact a living being. He is not Fulton, as one reader supposed. There is no reality to Fulton other than the name used for expression. Fulton, we are told, is like Jimmy Durante’s Mrs. Calabash, an ideal defined by absence. The date of the poem’s events really is July 3, and the location really is a mall outside Atlanta, Georgia where the summer heat rising from the asphalt is hellish. Floyd Byrom Thatch is a wounded vanity. He is a Georgia cracker on the order of a poor man’s Mephistopheles. And as someone obsessed with security he also has something of Lord Byron’s self-imposed exile. But Floyd is a real person, as all the others are. In the poem’s first part Floyd says to the speaker, “Who’s to remember . . . Who’s to remember a nickel or a dime / Or ever the time you saw your little dog get hit?” The poem’s narrator asks, “And how you think you know my dog was hit.” Floyd answers, “I’m saying, you were six; the dog was four, / Maybe five. Just saying that, nothing more.” That is, these things really did happen, and Floyd’s suppositions trouble the narrator because he has intuited something painful from the narrator’s past. The evil of Floyd’s wounded pride may be metaphysical (and universal on the order of allegory), but Floyd’s body and his history are matters of this world. The events of his life are no more allegorical than those of other lives that participate in the repeated patterns of our nature. In fact the events described are more disturbing than allegory would be. The narrator is hostile to Floyd’s speculation about the dog’s death because that event was real and the pain felt was real as well. In revising “Nod” I had to come to terms with the fact that Floyd’s suffering is particular even as his judgment is general. Floyd’s thinking tends to generate the very things about which he is so apprehensive. He believes in negative terms. He is in security as a result of his doubt. And June and the two children are fractional presences due to Floyd’s drawn vision. We get another take on the limits of Floyd’s circular darkness when June starts putting him in his place. There he is comic enough that the humor and the tragedy of the poem constitute two sides of the same object, human finitude. I have gone into all this as it relates to “Nod,” but the humor, tragedy, and revision you ask about in my poetry generally stem from situations that are either overtly dramatic or implicitly so. Short poems assume what longer poems unpack from their dramatic situations, but the basis for each is similar to all others. Character and motive, elaborated or not, are the first governing principles in the poems I write. They determine humor, tragedy, and all manner of revision. Like book manuscripts, book titles are often subject to change before publication. Was naming Couldn’t Prove, Had to Promise easy or difficult? How did the naming come about? My editor, mostly John Irwin of the Johns Hopkins University Press, has frequently been funny and helpful during the process of choosing the title for a new book. When The Run of the House was in press John kept asking me for different titles. Our son, Ian, was still very small but had a booming voice on the order of John Irving’s Owen Meany. There was this big voice and very little guy who made John Irwin laugh. At one point John asked what I thought Ian would say the title for the book ought to be. I said I don’t know, Ian’s not here to ask. John said, “Well what do you imagine Ian would call the book?” I said, “Run of the House, since that’s what he has.” John said, “I like that.” The next time I called, with another title, John said, “Marketing likes it, too.” The answer to your question is that a title should be both telling and cryptic. By a title the reader is introduced to a bit of a mystery. And that is as it should be since the book lives ultimately in the imagination of the reader. The second part of the answer is that we write for others, so title-to-last-line is considered finally in terms of what will work for the reader. The title is the first step in this. 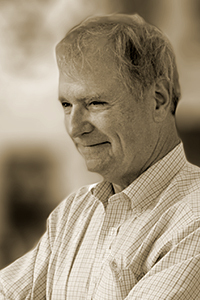 Wyatt Prunty is a professor of English at Sewanee: The University of the South and the founding director of the Sewanee Writers’ Conference. He is the author of nine collections of poems, including The Lover’s Guide to Trapping, and two critical works. 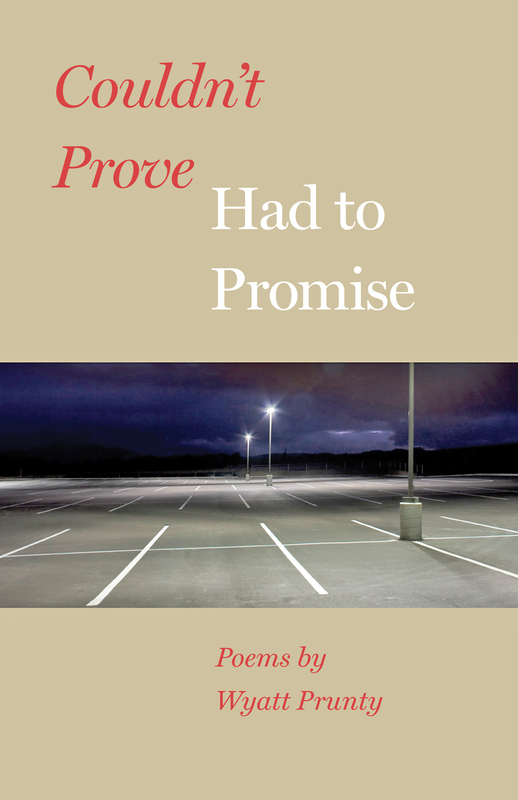 His latest collection of poems from JHU Press, Couldn’t Prove, Had to Promise, was published in 2015. Yasmine Kaminsky, a student at Johns Hopkins University, studies English and interns in JHU Press’s marketing department. Use promo code “HDPD” to receive a 30% discount when you order your copy of Couldn’t Prove, Had to Promise.